These days, it’s hard to imagine what life would be like without air conditioning. When we walk into a building, either commercial or residential, we almost take it as a given that we will be greeted by the sweet embrace of freshly cooled air. This couldn’t be more true than in Florida, where you’re looking for a way to escape the heat any way you can. We know how important it is to have AC in the Pasco County region and surrounding areas, which is why we perform air conditioning installation, maintenance, and repair for everyone who has need of our services. However, there was once a time where air conditioners didn’t exist, and people had to find ways to keep themselves cool regardless. There were people in Florida long before air conditioning became a thing, and they managed to make it, so if your air conditioning system happens to break down, it might be useful to think of these tips and tricks that kept people cool in an era where they had almost no protection against the heat. Here are some ways that people kept themselves cool before air conditioning, as well as a few modern tricks that can help to cool you down. Understanding how the body works is key to understanding just how much water can help to keep you cool. Have you ever started passively sweating when the temperature is just slightly higher than what it should be? Sweating is a mechanism your body employs to keep itself cool through means which are both internal and external. Internally, more water helps to provide oxygen to your muscles and work in harmony with your blood veins (which dilate in hot temperatures to help cool the skin above). Externally, your body releases sweat under hot conditions, and the resulting evaporation helps to cool down your body. When you drink your water, you’re giving your body more to work with inside, which can reduce the amount that you need to sweat. Furthermore, excess sweating can actually dehydrate you, so it’s important to have a sizable amount of water stored up so your body never runs out. Drinking water doesn’t necessarily cool you down in a way that’s super noticeable, but it does help your body to regulate its temperatures better, and you’ll certainly feel more cool than people around you who aren’t doing the same thing. Ever wonder how hot air balloons work? Hot air tends to rise, so when you’re in a space that’s higher up in hot weather with no air conditioning, you can bet you’re going to feel it. This is especially true in your home. It’s amazing how much of a difference it can make if you’re on the second floor as opposed to the first. If you’re feeling hot inside, make sure you’re not making the problem worse by hanging out in a space where hot air likes to gather. Underground spaces are by far the best solution, which often stay cool even if it’s blazing hot outside. However, most Florida homes are understandably built without basements, so if you’re among our clientele in Pasco County and the surrounding regions in Tampa, you might be out of luck in that department. The first two ideas in our last post aren’t that out of the ordinary, but if you’re like most people, the idea of freezing your bedding might jump out to you as weird. You’re not wrong, but hear us out! One of the most brutal parts of hot temperatures, as you are probably fully aware of as a Florida citizen, is trying to fall asleep. It’s much harder to fall asleep in hot weather than in any other climate. In cold temperatures, you have the luxury of stacking on layers until you form a warm cocoon, but in the heat, removing layers yields diminishing returns, and it might not be enough. At that point, your only hope is the AC system. But if you’re in need of air conditioning repair, you’re in a tough spot. If you freeze your bedding fabric and take it out when you’re ready to sleep, it will be nice and cool, perhaps providing a respite against the heat. Of course, we all know how quickly the cold side of the pillow betrays you when you turn it over, so don’t expect your cold sheets to last super long. However, research has shown that humans fall asleep within seven to twenty minutes, which might just be enough for you to fall asleep on cold sheets. It might sound crazy, but don’t knock it until you try it! 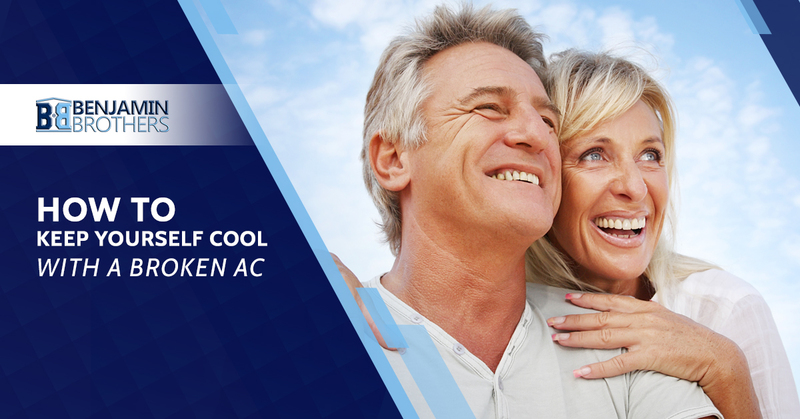 If your air conditioning unit needs repair, the second best thing you can do is get a fan. We’ve mentioned in other articles how a fan should be on everyone’s shopping list, due to how it can easily save you money on air conditioning bills. But this is never truer than when you don’t have an air conditioner at all! Fans don’t directly cool the temperature of any given room, but they have a cooling effect on your body by producing circulated air. When air is moving around, it helps us to feel cooler, which is one reason why hot temperatures are always more bearable when there’s a breeze, even if the temperature itself remains unaffected by the wind. Buying a fan is cheap (both in upfront cost and power usage), much more significantly so than an HVAC system, and they can do a great job at cooling a singular room. Square fans, when put in front of an open window, are particularly adept at cooling down your room during the night — maybe you won’t have to freeze those sheets after all. This one might sound counterproductive — you’re trying to beat the heat, not get more of it, right? But in certain situations, a building without air conditioning can be flat-out hotter than the great outdoors. It all depends on context, but heat can sometimes have a “hot box” effect on homes, making them comparatively hotter than the already hot air outside. This shouldn’t be new to anyone — think about how hot a car is compared to the fresh air when it’s been left in the sun. Ever wonder why a lot of older houses have big wide porches with shade pavilions? It’s because in older times when they didn’t have power, lounging in the shade on the porch was often a better alternative to staying inside. This still holds true; you might just be more comfortable if you find a nice shady space to hang out in. Bonus points if there’s a breeze! Finally, one of the best ways to stay cool when your AC is broken is to, well, fix your AC. If you’re in or around Pasco County, you shouldn’t wait to contact Benjamin Brothers for air conditioning repair and replacement! We perform all kinds of HVAC services related to your AC system. Whether it’s air conditioning installation, repair, or preventative maintenance, we’ve got you covered. Living in a hot house is no fun. Ready to get started? Contact us today!